I've seen you say as much before, "it's real but we can't do much, and there's more pressing problems we can more easily solve with less money anyway." What are your thoughts on problems that climate change is indirectly causing? For example, changing weather patterns leads to unpredictable rainfall, which leads to crop failures and food shortages, which is politically//socially destabilizing in the affected regions. Another example is that warming is moving the mosquito line further towards the poles (and other bugs too, such as the ash borer) which spread disease or kill trees//crops. These questions are impossible to answer objectively because there is no way to quantify the harm done by the effects of man-made global warming, just as there is no way to quantify the good that results from a warming climate. There are way too many variables at play. Rainfall has always been unpredictable, and crop failure has always been a threat. Data shows that even if climate change has negatively impacted food production, we have more than offset those losses. 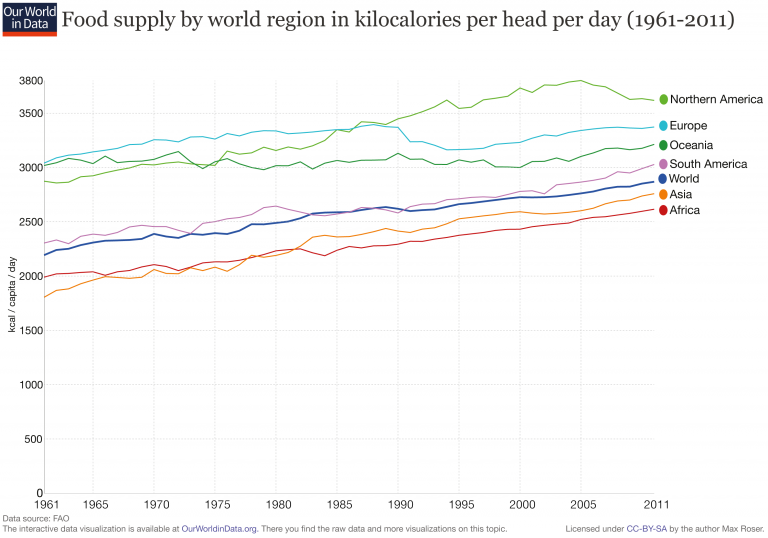 Global food production per person has trended upwards since at least 1961. I despise mosquitos as much as anyone, but there are more effective ways to control their numbers and their impact on health than the futile effort to turn down the temperature of the entire world. Malaria is an extremely survivable disease given adequate healthcare. It's orders of magnitude easier to provide adequate healthcare to people than to freeze those suckers out through climate change. Controlling their numbers through chemical or biological means is also much cheaper. Heck, CRISPR might even eliminate the ability for mosquitoes to transmit malaria.Mosquitos are a red herring to the discussion of the impact of global climate change on human quality of life. The threat of nuclear war poses a much more likely threat to humanity than global warming, for instance. It's not that climate change is not worth thinking about, it just isn't worth getting angry or losing sleep over... and buying a Prius certainly isn't something a person should feel smug about. Fortunately conservation and efficiency have their own intrinsic rewards, so the natural progression of things is to improve efficiency and conservation of resources. This progression of technology and efficiency will "automatically" reduce future greenhouse emissions way more than any silly Kyoto Protocol. Fighting human nature is a losing proposition. Even if 99% of people agree that humans have a significant impact on global warming, their behavior will change very little. Last edited by redpoint5; 05-30-2017 at 06:53 PM..
"Don't reform man, reform his environment"
redpoint you're all over the map. But overall you sound very jaded. The last thing you mentioned was fighting human nature is pointless. But my experience has been that humans have many kinds of lifestyles and natures. I've also noticed that money talks. Making consumption of fossil fuels expensive prompts people to do other things. Solar is becoming cheaper than coal in the USA. We're at a point now where the green energy revolution is happening and has started become economical. At the same time electric drivetrain options and batteries are becoming better and better for transportation. And automakers are finally making aerodynamics a serious part of every vehicle they produce. Pretty soon, in most situations, the green options are going to be the cheap options, and that's going to drive a change in human behaviour. As long as China and India don't think it's a problem there isn't anything the developed world can do. Any reductions made by the US, oh Canada, UK, and Europe will be replaced and them some by fast growing China and india. The only thing the big developed nations could do that would have any lasting or immediate effect would be to build more nuclear power plants. Everyone says they want to reduce CO2 until they are actually given options that will reduce CO2. Then all of a sudden they don't want to do it. Do note that China is leading the way in terms of renewables, with thier big hydroelectric and solar projects. 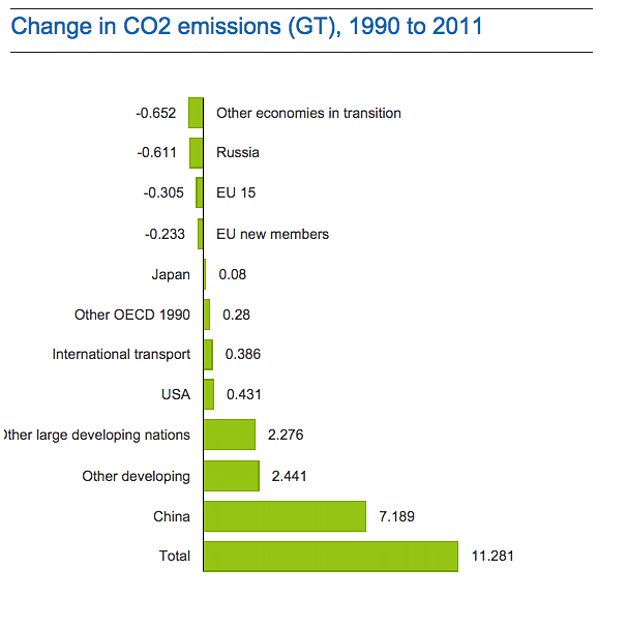 I feel sort of... semi-optimistic that we can still reduce our carbon footprint further. More and more, online work and even online shopping are reducing the need for travel. When you've got a population that only travels for special occassions rather than to work and shop, you've got a vastly reduced carbon footprint per head. Then there's the whimsical news that the adoption of LED lighting is shrinking the GDP... ...we've got ways to bring things down without spending huge amounts. Maybe the future won't have millions of cars in it... and maybe I won't be able to read at night by the warm glow of an incandescent bulb (but "fake" LED-powered incandescent-a-likes, with their LED "filaments" are amusing enough)... but I expect I can live with that. The US has also lead the way in renewables. The US has been the number 1 producer of geothermal power since the 1960s. Was the number one producer of hydroelectric from the 1930s up until recently. A iron smelting company in Maine started the first some what large scale recycling program in the 1820s when they figured out a way to add old metal bits to new iron ore and get everything to melt. Most recycling stopped after world War 2 due to cheap energy. Brayton Point - the last coal fired power plant in Massachusetts - closed down today. What replaced that coal fired capacity? Not all coal plants are bad, some fly ash is needed to make cement and pavement. Unless anyone thinks burning coal just for the fly ash is a good idea. Pretty soon, in most situations, the green options are going to be the cheap options, and that's going to drive a change in human behaviour. I'm pessimistic about changing human nature, but I'm optimistic that our greedy nature will continue to innovate more efficient products and cheaper sources of energy. This view of people is very consistent. Sure, there are exceptions to the normal way most people behave, but living in tiny houses and eating a vegetarian diet is never going to be popular with the majority. China is leading the way in something, but I'm not sure we should give an award for it. Last edited by redpoint5; 05-31-2017 at 11:34 AM..
Increases in solar, wind, hydro, and possibly gas, I think. Even a little biogas? No new nuclear - Pilgrim nuclear is closing down soon, too. No love for Moon power? It's reliable and inexhaustible.